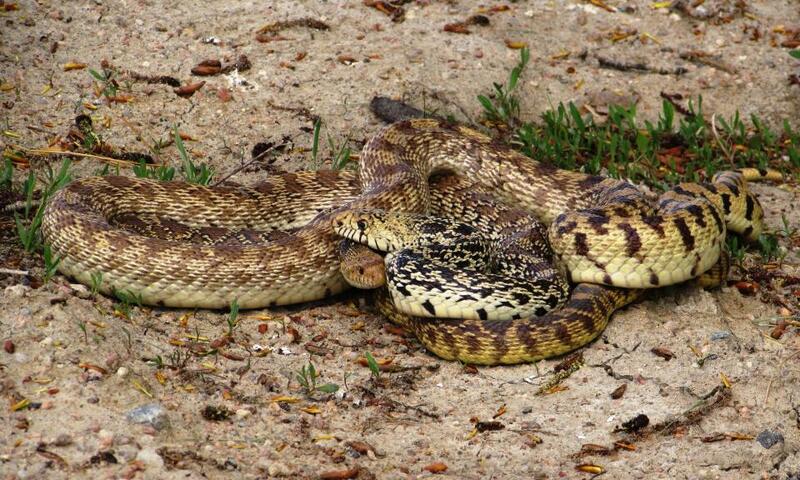 Driving down the country road in late spring I came across these two bull snakes in the middle of the lane. Of course I could not leave them there to be hit so I backed up my car to block them. I didn't have anything that would keep me at a safe distance from them (even though they are not poisonous) except an umbrella stroller (laughing). I pushed them off of the road and they remained intact providing a future for their species. As I was pushing them aside I heard a rattling from the darker snake. Again they were just signaling me to leave them alone. I continued on my way knowing that they were in a safer place. Upon returning down the road just over an hour later I saw that they were still intertwined and relieved that they were indeed mating as I had thought before and not eating one or the other.